Bairro Alta district. Jane and Randy on Calcado do Duque. Notice behind us the diners in the middle of the street. residence until the late-15th century. Baixa district next to Praça da Figueira (the square). View of Tejo River waterfront in the lower Baixa district from São Jorge Castelo. Randy and Jane at São Jorge Castelo overlook. Belem district 3 miles west of downtown. Built around 1500 by King Manuel I.
Belem buildings survived the devastating 1755 earthquake. of many cow art pieces around the downtown. Jane and Randy in café at the old university. Famous 18th century Coimbra University library. Postcard. View up to the Paço de Calheiros manor house where we stayed four nights. we had dinner at the Little Pigeon restaurant nearby. Rich, Celia and Cameron downtown. Cam and Celia in front of 14th century Parish Church. Cam and Celia closeup at church. Cam and Jane in front of church. Walking on the Roman-medieval bridge that crosses the River Lima. Mary-Carter at the Roman section of city gardens. The famous Roman-medieval bridge for which the town is named. This is the medieval part of the bridge. Picture of the town from across the river. Along a street, a public water faucet dating to 1617. The two Birthday Queens reign at the dinner at the Paço de Calheiros manor house. of the Bom Jesus de Monte church near Braga. Part of the gang - no Bard-Congdons - at Bom Jesus church. Back row from left: Jim, Kerry, Linda, Randy, Jane, Bill, Mary-Carter. Front row from left: Lysbeth, Sarah, Hope. where we stayed four nights. did get into a swimsuit and into the pool! Fields and vinyards of the Paço de Calheiros manor house. Individual apartments at the Paço de Calheiros manor house. Each one had a bathroom, kitchenette and upstairs loft. Most of our friends stayed in these apartments. We guessed that these were once stables. Courtyard at the Paço de Calheiros manor house. Front of the 17th century Paço de Calheiros manor house. The family crest is above doors to chapel (center). Randy and I stayed in an apartment in this house. The Calheiros family has owned the estate since 1336.
at the Paço de Calheiros manor house. gathered guests here for drinks before dinner one night. A lot of the wood in the house is chestnut. two bridges across the Lima River, including the famous medieval one. Kerry relaxes on the Paço de Calheiros grounds before dinner. outside their Paço de Calheiros apartment. Susannah finds a pan for dinner. our group at Paço de Calheiros manor house. reserved for our group at Paço de Calheiros manor house. would closely resemble the count. Most of the gang in front of Paço de Calheiros manor house. No Sarah, no Linda, no Jane, no Lysbeth or Hope. Count Francisco Calheiros is bottom left. No Sarah, no Linda, no Celia, no Lysbeth or Hope. Jim, Sarah and Hope at Paço de Calheiros manor house fountain. Jim and Sarah at Paço de Calheiros manor house fountain. The two Birthday Queens, Jane and Mary-Carter. restaurant in this Lima River town and had a tasty lunch together. in Soajo is made of granite, the locally available material. The rural town is in the Peneda-Geres mountains near Spain. left side of the street. This is for storing grain, usually corn. where some of our group stayed, accommodated eight. Each of the four bedrooms had a bath. Bill and Mary Carter, and Kerry stayed three nights. in this town are very dark inside and lighting is dim. brought us a delicious breakfast each morning at whatever hour we requested. coffee, ham, cheese, eggs, a guava gelatin, yogurt and fruit. where Randy and I (and three others) stayed. The statue, a pillory, dates possibly to the 17th century. and Jane, financed lodging for our group in Soajo and Ponte de Lima. Water ran through the town in many places. show up much in the human diet. been used to store corn, keeping it dry and protecting it from rodents. Sheep on Main Street in downtown Soajo. The environs are hilly and many houses are built on terraced hillsides. Our chief hangout spot was the front steps of Casa João Fidalgo. Rich and Randy at cribbage in Casa João Fidalgo living room. We had a great dinner in the kitchen of Casa João Fidalgo. lots of cows. Note the one on left side of the road. Corn seems to be the main crop in these parts and there's plenty of livestock to eat it. higher elevations with the changing of the seasons. Jane and Kerry pause for a picture along the path. Typical countryside on our hike. summer village in the hills above Ermida. View of Lima River valley below. Notice the summer village in lower right corner of picture. Another morning hike, this time right out of Soajo. View back to the town as we ascend into the surrounding hills. Another view of the town from higher up. Pastoral scene during our hike. Another view of the town and environs from further up. On a scenic drive through the park. built into the Peneda granite mountains. facilities. There were some tourists but not that many. Castle of Castro Laboreiro, which dates back to the 11th century. 3,400 feet and can be rather scary to walk around. Sarah at 11th century Castro Laboreiro Castle door. View down to the town of Castro Laboreiro from inside the castle. View of castle wall and surrounding mountains. 11th century castle of Castro Laboreiro is perched. meets the Atlantic Ocean. We stayed the night here. with a fountain and many restaurants and cafes with outdoor seating. We bought day-old International Herald Tribunes at a news shop here. 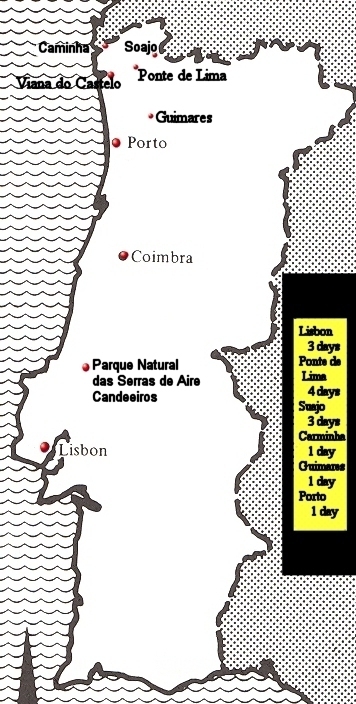 the first capital of Portugal in the 12th century. the 14th century Gothic canopy in front of the church. Praça de São Tiago or Santiago Square. Roman times. Unfortunately, our museum guide spoke only Portuguese. uncovered here are kept at the Museu Martins Sarmento in Guimares. that are kept at the Museu Martins Sarmento in Guimares. I don't know the age of these though. clothes washers are uncommon in Portugal. on the buildings: Sandeman, Warre, Burmester, Dow. The waterfont promenade known as the Ribeira. Ponte Luis I, one of six bridges crossing the Douro River. Randy on the waterfront promenade known as the Ribeira. Note the light rail train on the Ponte Luis I bridge. along the Douro River known as the Ribeira. View of the town and the remains of its old fortress walls from a boat ride on the Douro. to town above. In background is Ponte Luis I bridge. On right are fortress walls. Below is Douro River. The Casa da Musica or concert hall designed by Rem Koolhaas. windows reminded me of sound waves. Backside of Casa da Musica designed by Rem Koolhaas. Randy inside the Casa da Musica designed by Rem Koolhaas. Undulating grounds of the Casa da Musica designed by Rem Koolhaas. Jane and expansive view of the Atlantic Ocean and coastal plain. of the local limestone quarry operation. rural area. Notice the windmills in the background.